Mr. Hildebrand is a significant and important contemporary Canadian painter. It’s obvious because his most recent exhibit was reviewed in Canadian Art magazine (written by no less than the editor-in-chief! ), Le Devoir and one of Louise Blouin’s magazines. The only things that could make him a more important and significant contemporary Canadian painter would be a review/write-up/preview in ArtForum, the New York Times/New Yorker/New York Review of Books, or some publication in London, Paris Berlin or Shanghai. This is both a good thing and a bad thing. It’s a good thing mainly because he is a very accomplished artist, looking at his work, I get a very strong sense that not only does he know what he wants to do, but he know how to accomplish it as well. There’s nothing namby-pamby about his work. Adjectives like forthright, bold, strong and direct are the ones that I would think of using in order to describe his work. It’s a bad thing because he only gets reviewed in local media outlets and his paintings sell for a song (The work in this exhibit was selling in between $800 and $15,500 depending on size, and how much (or how little) color there was). Both of these are examples of (apologies for repeating myself here) how little respect Canadian/Quebecois/Montreal art gets in the rest of the world. Mr. Hildebrand has exhibited in Auckland, Beijing, Chicago, Los Angeles and Miami, among other places, and will be exhibiting in London but there is nary a peep in anything other than the good old Canadian intelligentsia about his work. It’s frustrating. It’s getting to the point where I’m beginning to question if Canadian art really is truly good art. Or if what is being called good is merely a function of myopia. (As an aside, I think I should point out and say that it is a good thing that I wear glasses). But enough about the politics (at least for the time being) and on to the art. In all the other reviews that I’ve read and in the artist statement that accompanies the show, a big deal is made out of the use of the color green. While I understand both the significance, historical antecedents and reasons Mr. Hildebrand states for using green (“the chalkboard, the cutting mat, or the green-screen”) given that almost 40% of the show were drawings in a sort of architectural bent. Simple gray lines on a cream colored paper, I’m not certain I’m drinking that Kool-aid. I’d much prefer to put my emphasis on the title and the works themselves. 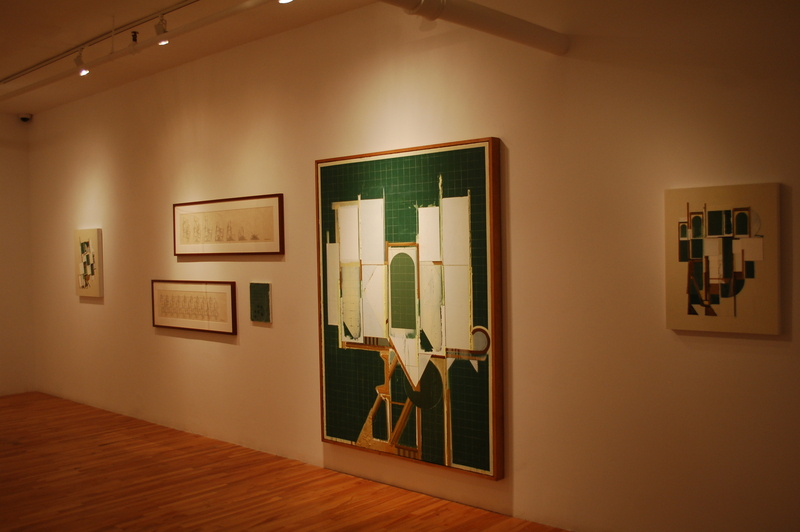 Dil Hildebrand, Back to the Drawing Board (Reprise), Pierre-François Ouellette art contemporain, Installation view of Reconstruction 01 and Net Structures 01, 02 and 03. I think I’ve always been a big fan of drawing. Maybe because I can’t do it to save my life, or perhaps because of the simplicity of the act, or maybe I’m just full of it, and in fact I never really liked drawing ever. But for purposes of this argument, let stick with the positive for whatever reasons. 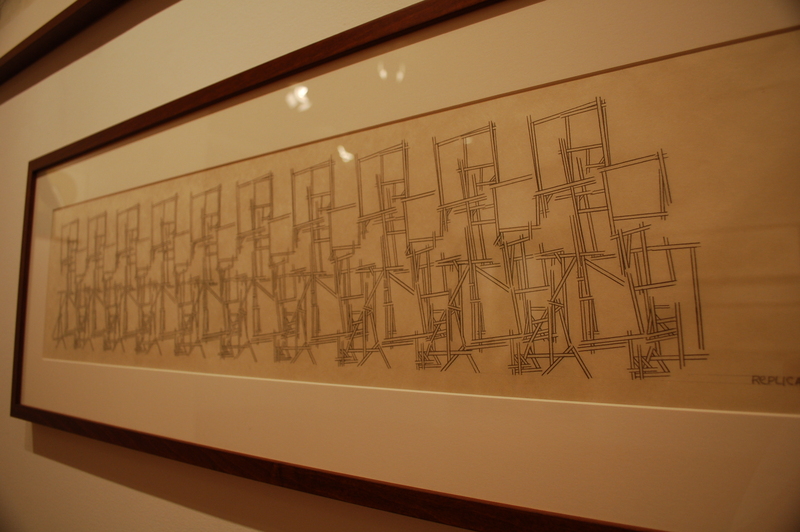 Mr. Hildebrand’s drawings are of some extraordinary objects that at first appear to be some kind of structure. Something like the plans for a house of cards, an aerial view of some maze or now that I think about it the kite like structures from John Horton Conway’s mathematical Game of Life a representation of Pick-Up Sticks. Viewed from a distance (and from my memory) the polytopes seem to form some sort of pattern. Not quite Penrose tiling but close. And I’m certain if I stared at them long enough I would be able to come up with some kind of mathematical formula to describe what they were doing. By calling the show “Back to the Drawing Board,” Mr. Hildebrand is tacitly admitting that whatever was done prior didn’t quite work out the way he intended. I can’t help but think that the repetition of forms helped in finally getting the finished product the way he wanted. It’s almost as if you can see the process taking place even though the drawing in front of you is complete. Despite the simplicity of the drawings they are extremely powerful and even a full month after seeing the show I can still imagine them in my mind as if I had seen them half an hour ago. 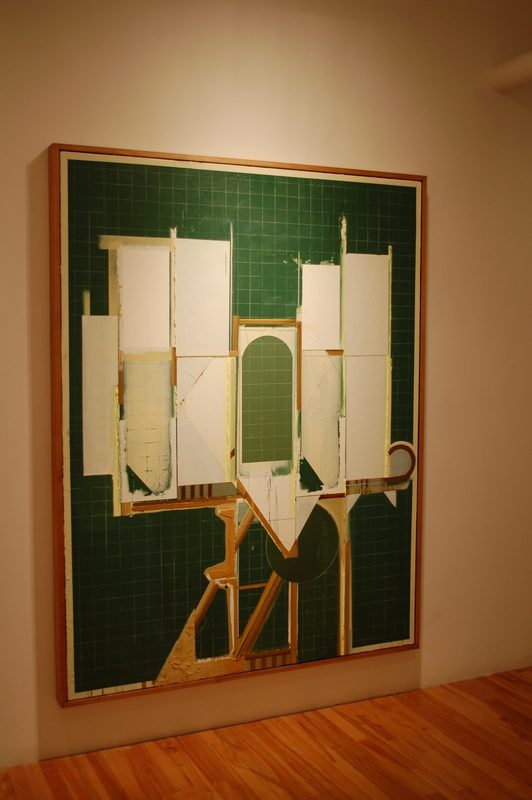 The actual paintings in the exhibit, the things with the color green in them, did not affect me as strongly. It’s easy enough to see how they are related to the drawings, but I did not get a visceral sense of anything from looking at them. They almost appeared to be some kind of academic exercise, which is surprising as the drawings, when viewed from a technical standpoint could be considered by anyone’s definition academic exercises. 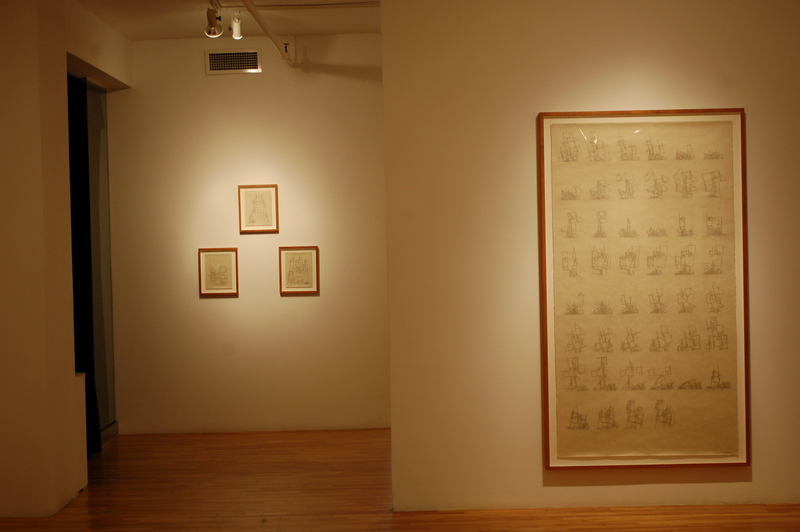 I think that it might have something to do with the fact that, for the most part, the paintings are titled as objects (Compartment, Contraption, Module, Parabola, Spire) while the drawings, for the most part, are titled as actions (Reconstruction, Dismantling, Replicating). But then again, since grammar was (and still is) not my strongest subject and I’m picking a choosing titles that fit my theory, I could be very wrong. And then there is Treehouse. A glorious painting if there ever was one. As you might expect I’m not entirely convinced it is a representation of a actual tree-house. To me it looks more like an imagined memory of what a tree-house was, or could be. Or more precisely like a collection of doors. Doors that are unlocked with the key of imagination. More white than green, with some brown thrown in for good measure, it seems like some sort of gateway. I’m not certain how it fits in with the title, unless you go for the Helen Keller (or Alexander Graham Bell) quote about doors opening and closing, which I would have sworn was Zen or Buddhist and not American. But even then it’s kind of a stretch. I think the reason I like it has more to do with the form and structure of the painting than the actual content. It has a certain heft, that by extension makes it feel important. I could kick in here with the cheesy puns and talk about how if Mr. Hildebrand doesn’t at first succeed, but I’ll avoid that. I also would like to try and figure out some way to link either his paintings or the drawings or both to some sort of hope or possibility of him being able to make it as a Canadian Artist (with the capital C and A) but I’ve been wracking my brain for the past hour and half trying to figure out some sort of way to tie things up neatly so it looks like I know what the heck I’m talking about. But I can’t, for the life of me think of anything. So I’m going to have to leave it like this, kind of dangling and not quite perfectly polished.